As of noon yesterday the death toll, as a result of the natural disasters caused by cyclone ‘Mora’, had risen to 203, according to information provided by the Disaster Management Centre. An estimated 629,742 people, belonging to 163,701 families in 15 districts, have been adversely affected by floods and landslides. Thus far, 96 persons have been reported missing while a further 77,643 persons, belonging to 19,876 families, have been relocated to safe locations by officials. 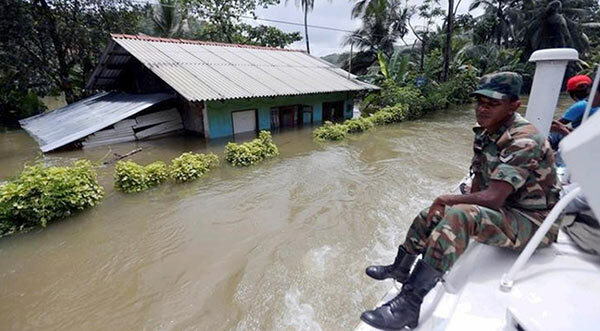 The Districts of Ratnapura, Matara and Kalutara were the worst hit by the affects of Cyclone Mora with 145,247, 182,711 and 152,481persons affected in each of these districts respectively. Ratnapura District had the highest death toll with 84, while 63 had died in Kalutara and 28 in the Matara District. The Ministers appointed yesterday, where are they? Are they organising celebrations in 5 star Hotels (like the newly appointed President Counsels)? In Colombo, they are feasting while 203 lives have been lost due to failure of stupid governments to protect human lives, adequately. Minister Mahinda Amaraweera, the President’s pick for a future Southern Leader, where is he? Is he leading relief efforts? Or is he organising a party? Of course, Eran and Harsha have never seen a flood, you know, they wouldn’t like to get their feet wet in contaminated flood waters and Ranjan R would visit the flood unless he is being filmed for a scene in a Sinhala movie. Many of the dead are being sent to rest without a coffin, I think it is time for the common people to rise against the idiotic rulers, present and past.